There’s a lot that is negative about social media and so often the traditional media can’t wait to make sweeping statements about how these new forms of communication will be the downfall of society. They so rarely seem to cover however, the amazing tools they can be to actually bring people together, to inspire and, in many ways make the world a better place. 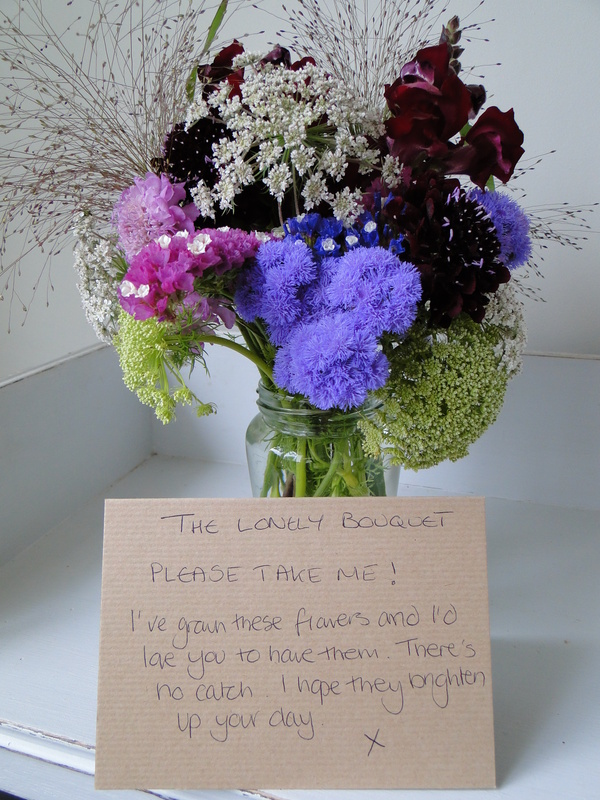 I first heard about ‘lonely bouquets’ from my friend Sara. 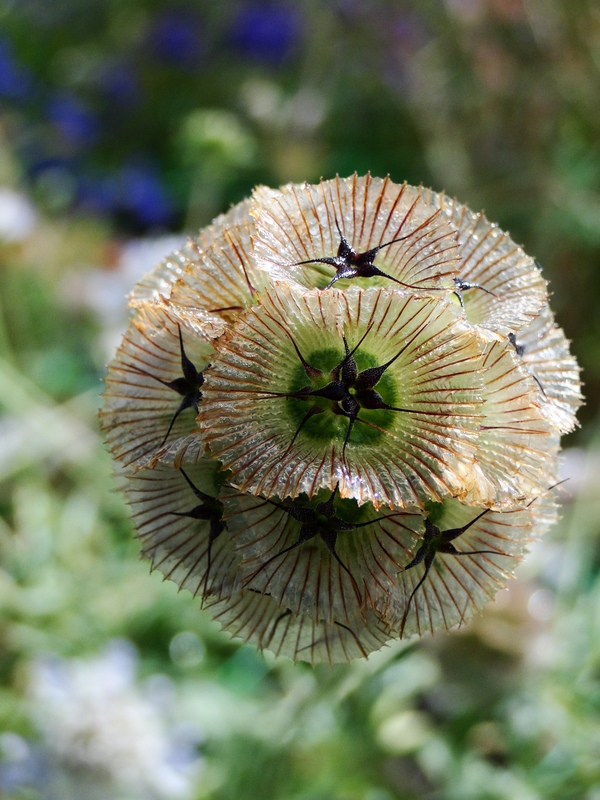 She’s an amazing flower grower in Wiltshire and if it wasn’t for twitter we probably would never have met. I spotted one day that she had tweeted to say she had left her ‘lonely bouquet’ at a bus stop in her village and that she hoped it had gone to a good home. Intrigued I asked her about it and she pointed me in the direction of a blog called Fleuropean. 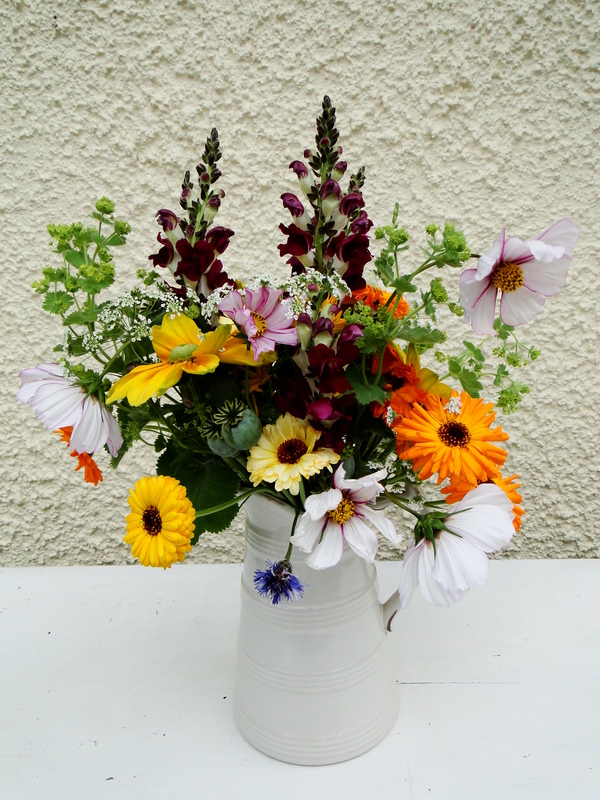 The idea was the inspiration of Emily, an American living in Belgium and the basic principles are: to pick some fresh flowers from your garden, make up an arrangement in a jam jar or similar, attach a ‘take me’ tag and then leave them somewhere for a passer-by to pick up and brighten up their day. I just love it. So yesterday I picked some flowers and then left them in buckets in the cool and dark of my downstairs loo to recover from being picked in the heat of the day. The plan was to arrange them last night and drop them off at my chosen location early in the morning so nobody would spot me. Of course the best laid plans and all that meant I was frantically arranging flowers this morning and had to postpone my delivery of them until lunch time when I got back from an appointment. I had decided to pick the village doctors’ surgery for the placement of the flowers. Partly because it has an overhanging roof which would provide them with some shelter from any heavy downpours but mainly because, well lets face it most of us need a bit of cheering up if we’ve had to go along to see the doctor. There was a slight spanner in the works, as I remembered at the last-minute that it was Wednesday and that they only take appointments until 12 pm. As I sprinted around, clutching the jar and card I was worried there would nobody around to see them. The other problem was putting them somewhere they would be spotted without being spotted myself. I timed it well so that I got them to the door without been seen from outside, although I’m sure those waiting inside must have wondered why there was a hunched, black waterproof-clad person acting a little furtively on the other side of the glass door. You’re meant to take a photo of them in the spot where they are left but this would have drawn too much attention to the whole operation so you’ll have to make do with the image of them in my kitchen. I retreated to a seat outside the primary school which was close enough for me to keep an eye on proceedings but not so close to draw attention from any visitors. And then I waited. I knew I couldn’t sit there for too long as I did have work to be getting on with but I thought it would be nice to see them taken away, and if all else failed I could move them on to another venue if they had been untouched by the time the surgery closed. I was also intrigued to see people’s responses. Would they think there was a catch or just not like them? I had only just sat down when a Land Rover pulled into the car park. A smartly dressed farmer got out and wandered up the path to the surgery. I was silently saying in my head, ‘Pick them up, pick them up!’. I saw him stop by the door. He stood still as he was read the card and scratched his head in a very Stan Laurel way. He was obviously flummoxed by the whole idea. He went inside and minutes later came out with a prescription and got back in his Land Rover. I was a little bit disappointed if I’m honest. More cars arrived and several people walked through the door without even seeing the flowers. This was annoying. Maybe I had put them in the wrong place, especially as I knew the likelihood of people seeing them on the way out was slim. But then a woman leaving caught sight of them and stopped, bent down to read the tag. I was willing her to take them but then she too left empty-handed. Mmmm, maybe this wasn’t going to work. A little red Corsa turned up and a woman in her twenties got out. I was a little more hopeful that she might be more open to the idea. She stopped and looked, but only briefly and then went inside. At this point I was starting to think about time scales and how long I could justify waiting in the hope I would see them taken. I have to admit to also thinking, ‘Jeez what’s wrong with you all, they’re pretty flowers not a hand grenade’. I didn’t think it was in the spirit of the idea to go up to someone and shout ‘Just taken the blinking flowers’. And then the door opened, and the twenty something woman came out, with one of the doctors in tow. She pointed to the flowers, they stood and looked and then the doctor bent down and picked them up and they both went inside. I don’t know who eventually claimed the flowers but I was pleased to see them taken indoors at least. Walking home I tried to suppress a grin because it felt such a lovely thing to do and it had also been so intriguing to watch people. I felt a bit like Amelie in the French film of the same name. I don’t think it’s my last lonely bouquet, I just need to think of some more suitable locations. If you’d like to take part have a look at Emily’s blog. One of my greatest successes this year on the plot were my cut flowers. I was inspired 2 years ago by Sarah Raven to grow some cut flowers in raised beds in my garden and I loved being able to pick them and have fresh flowers in the house. So when I got the allotment at the start of this year I knew I wanted to devote some of the plot to cut flowers. This is the first of 2 posts. 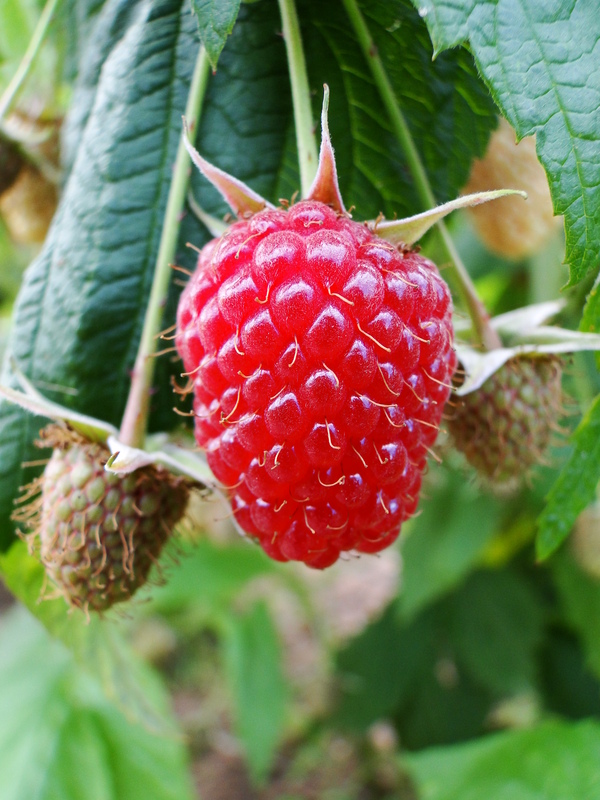 This post will be about this year – my successes and failures and the next post will be about my plans for next years cutting patch. I devoted 3 of my beds to flowers with a few other patches here and there. 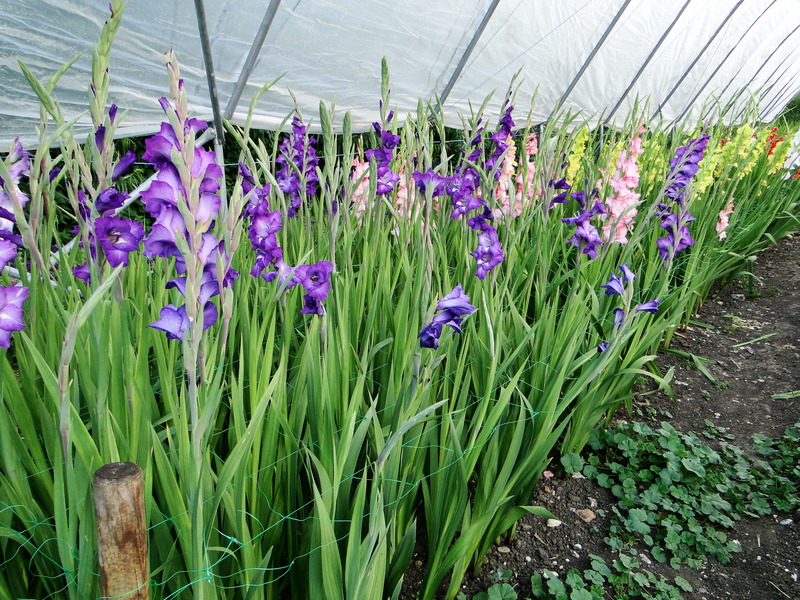 The beds are 1.2 metres wide and just over 6 metres long. 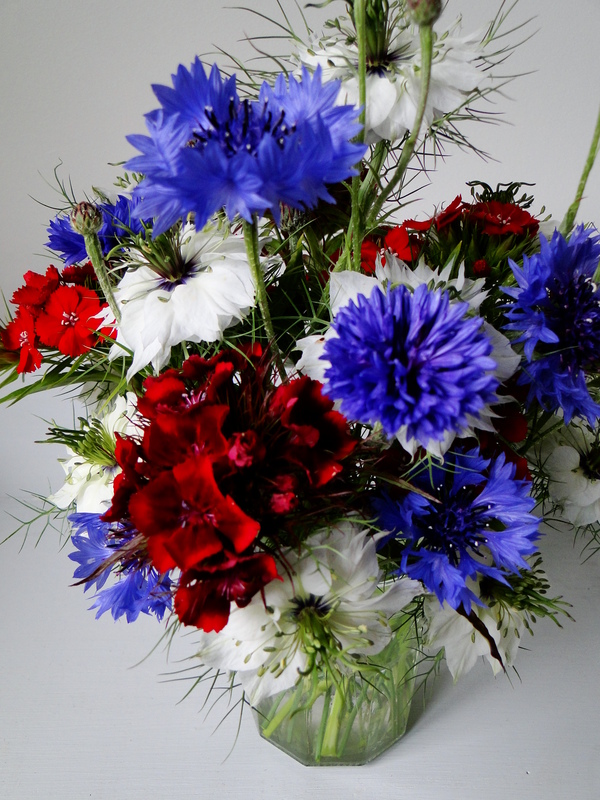 I grew the following for cut flowers: blue cornflowers, Cosmos Dwarf Sonata Mix’, Cosmos ‘Candy Stripe’, Antirrhinum ‘Night and Day’, Calendula, Gysophila ‘Covent Garden’ Ammi majus, Dill, Rudbeckia ‘Prairie Sun’ and Rudbeckia ‘Cappucino’, Zinnia ‘Sprite Mix’, 3 types of Sweet pea, Nigella, Sunflower ‘Vanilla Ice’ and Sunflower ‘Ruby Sunset’, and some Dahlias. I grew all of these from seeds and the vast majority were started off indoors and the transplanted out. This made for a very hectic April and May but I definitely think you get stronger and healthier plants and they flower earlier. 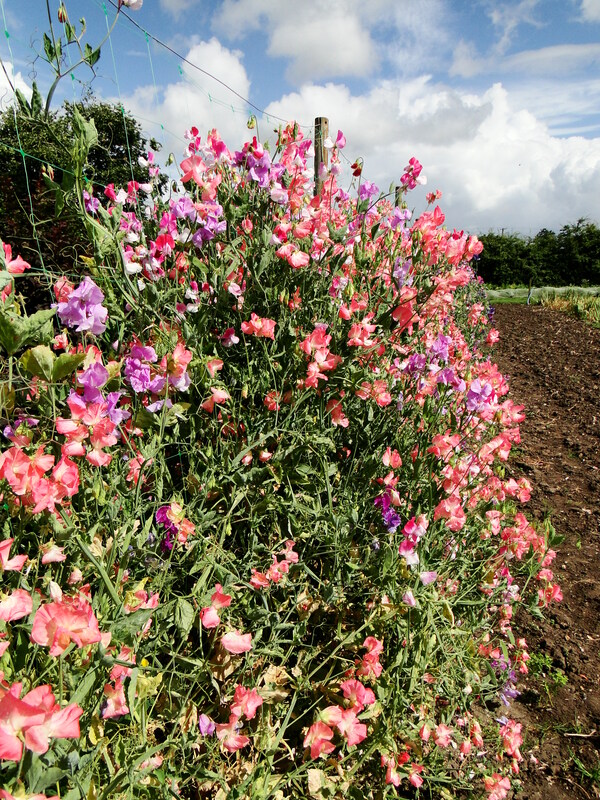 The Sweet peas sown at the start of March were the first to flower at the end of May and then continued to flower right through to mid September. The main bulk of my flowers were over by the 2nd week in October. So I had just over 4 months of cut flowers which I was really pleased with. Once growing the plants didn’t need much extra care. 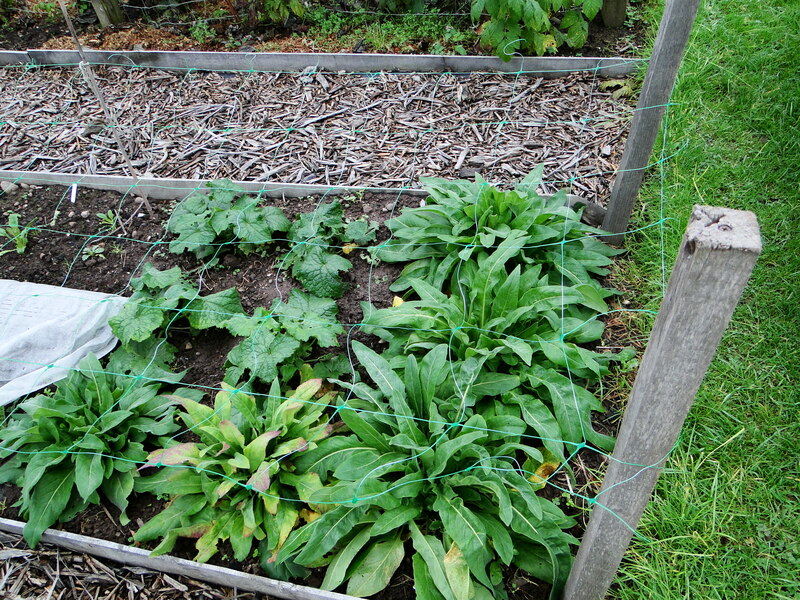 For 2 of the beds I put in wooden stakes at the corners to a height of 45cms to which I attached a long roll of bean netting across the whole length of the bed so that the plants could grow up through the netting and it would act as a support. 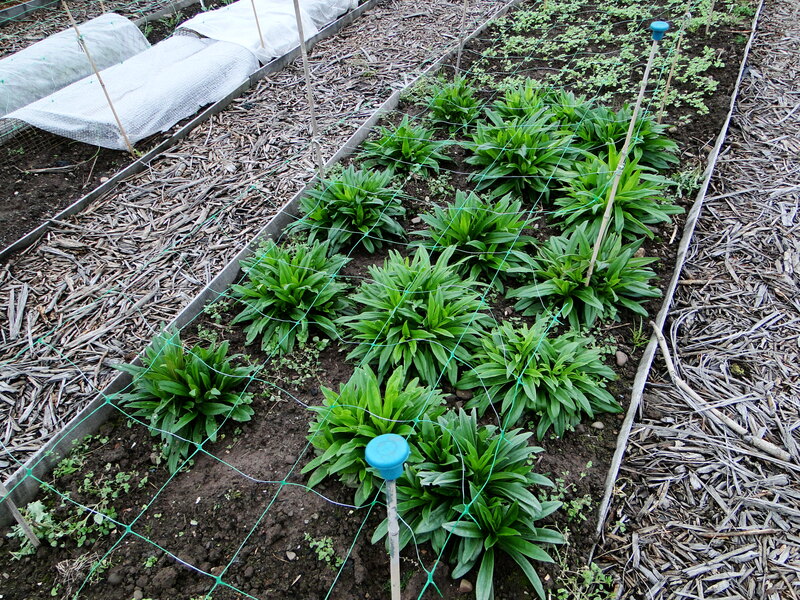 Because my beds are so long I put in bamboo canes at 1 metre intervals along the edges of the beds and tied the netting to the canes just to give the netting itself more support. There’s no point the netting sagging otherwise the plants will flop all over. I found this support system worked really well and I’m going to use it on the third bed next year. Inevitably some flowers worked better than others. 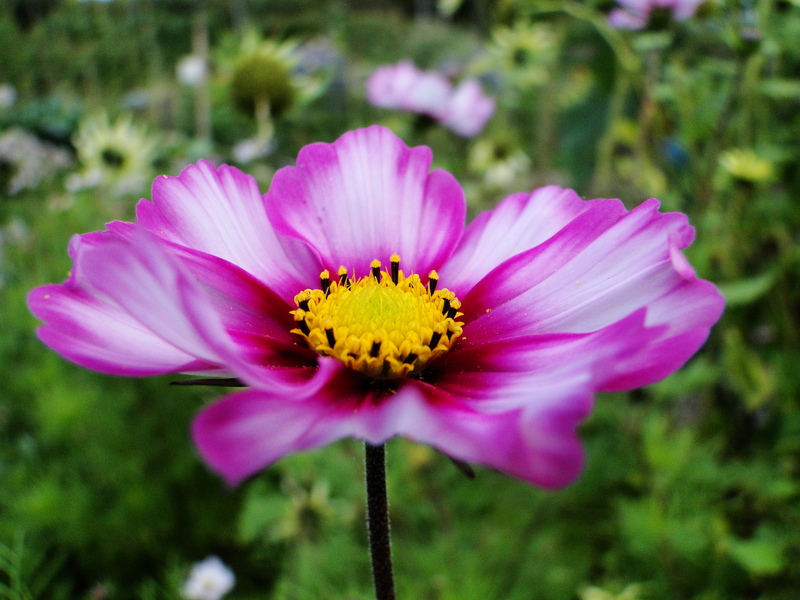 For example the Cosmos ‘Candy Stripe’, had longer stems and more delicate and interesting flowers than the Cosmos sonata. 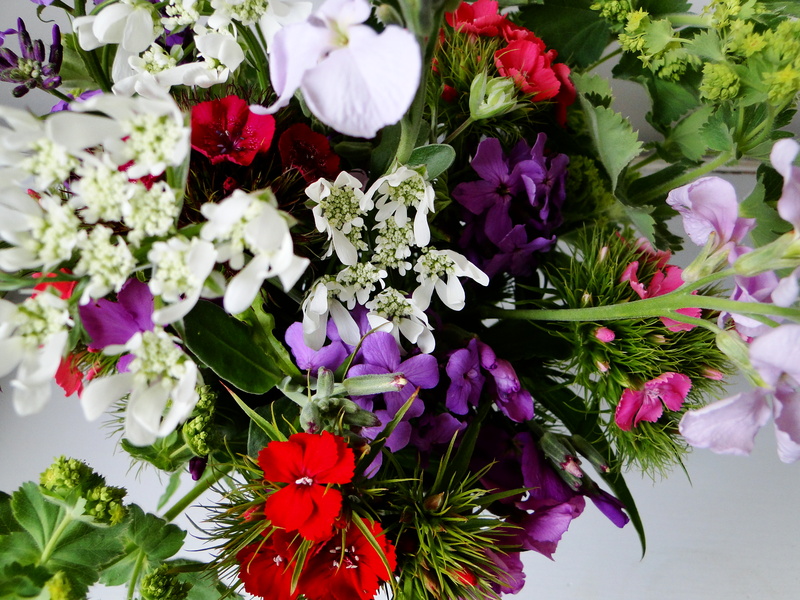 The Gypsophila were lovely but created quite a straggly patch which made it difficult to pick the stems I wanted. They were also over quite quickly and would need successive sowing to really be of any use. 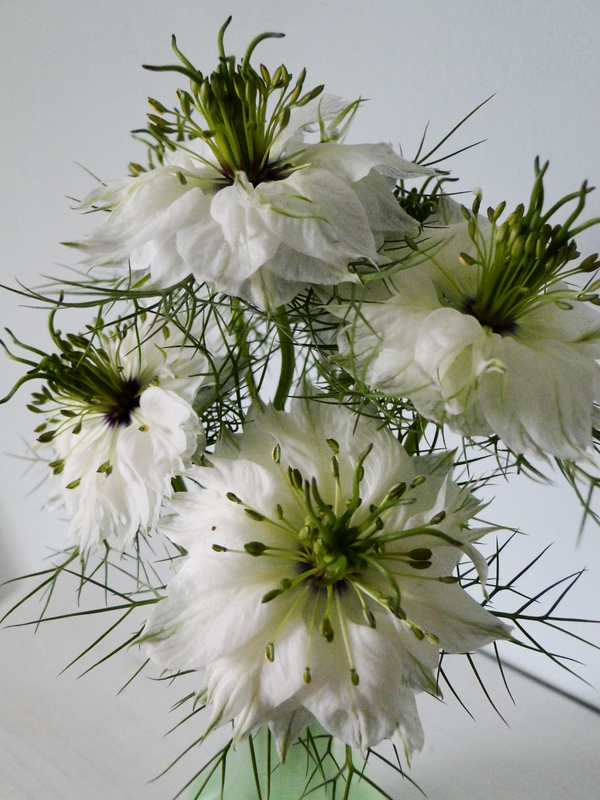 The Nigella I grew was a mix of whites and blues but it proved to be really disappointing. 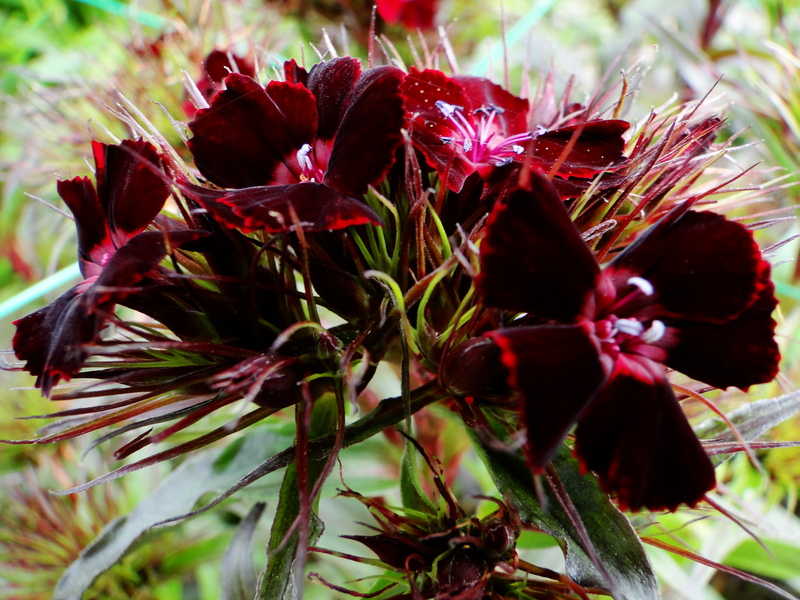 The flowers opened up and were neither one nor the other and quite a few of the flowers were stunted and deformed. The sunflowers I grew were beautiful. The ‘Vanilla Ice’ variety are a lemony colour with smaller flowerheads and smaller more delicate stems and worked really well in arrangements. The ‘Ruby Sunset’ variety were much larger and more substantial flowers and looked amazing grouped together, about 6-7 stems in a tall vase. Very Van Gogh like. Unfortunately they were a variety that produced pollen which made quite a mess. 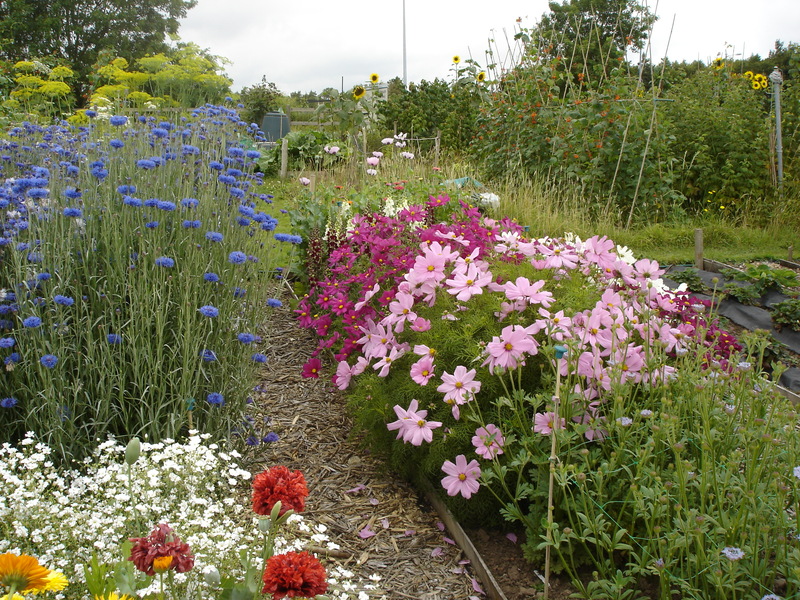 I am reluctant to use a pollen free variety because I always try to garden with wildlife in mind but I think with a third of my plot devoted to flowers I shouldn’t feel too guilty if I do choose a pollen free variety next year. 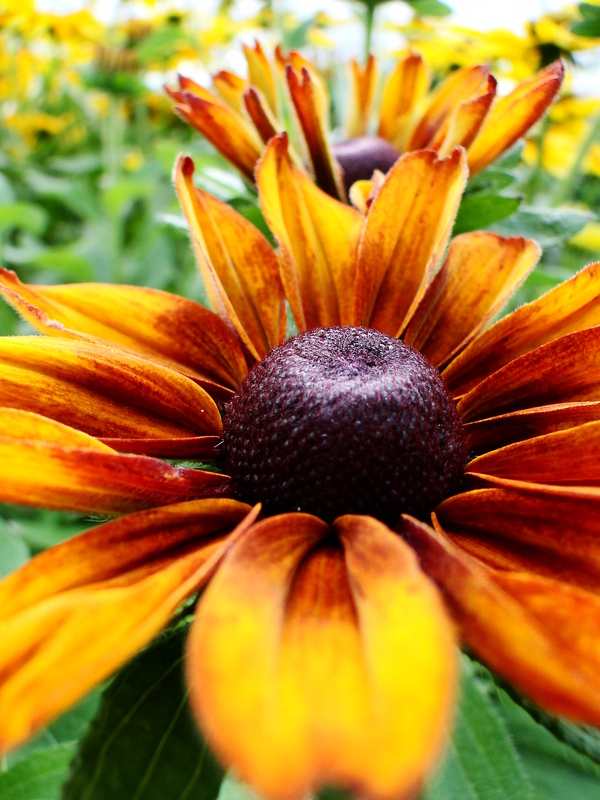 The Rudbeckias were brilliant but I did struggle to get the ‘Cappucino’ variety to germinate and in the end ended up with only 2 plants. 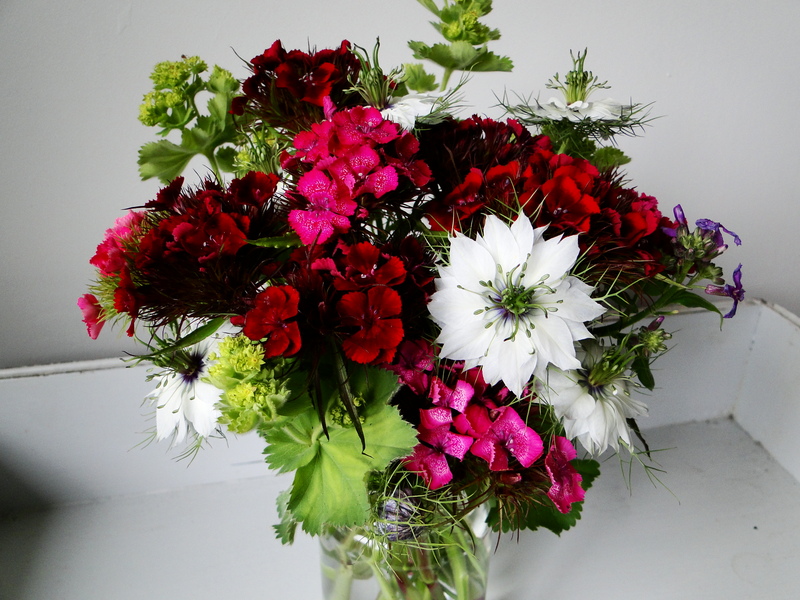 So all in all I was pleased with my first proper attempt at supplying myself with cut flowers throughout the summer. 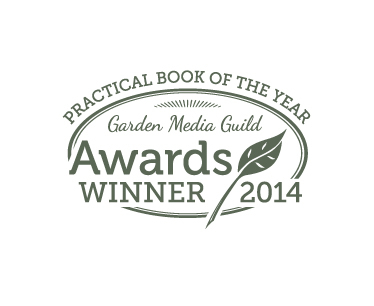 I learnt a lot and I hope to have a better selection of flowers over a longer period of time next year. 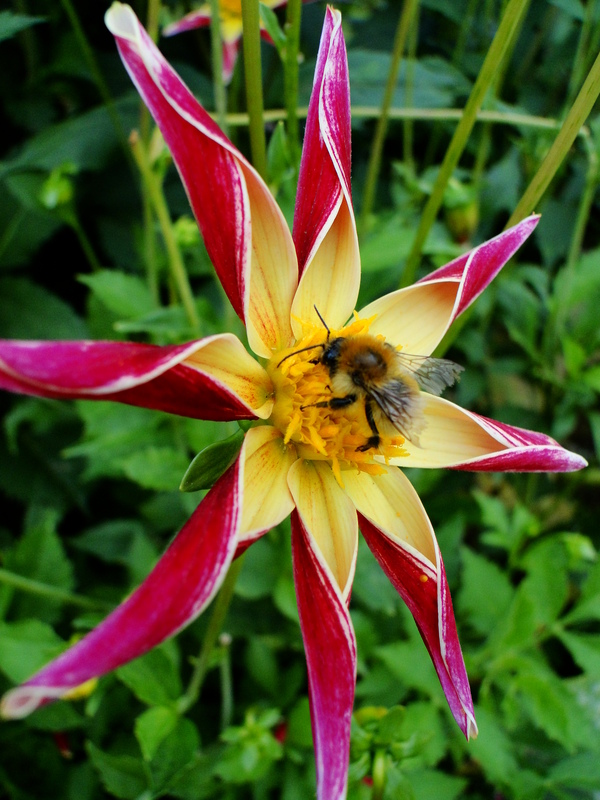 Cut Flowers – Why are British flowers the bees knees? 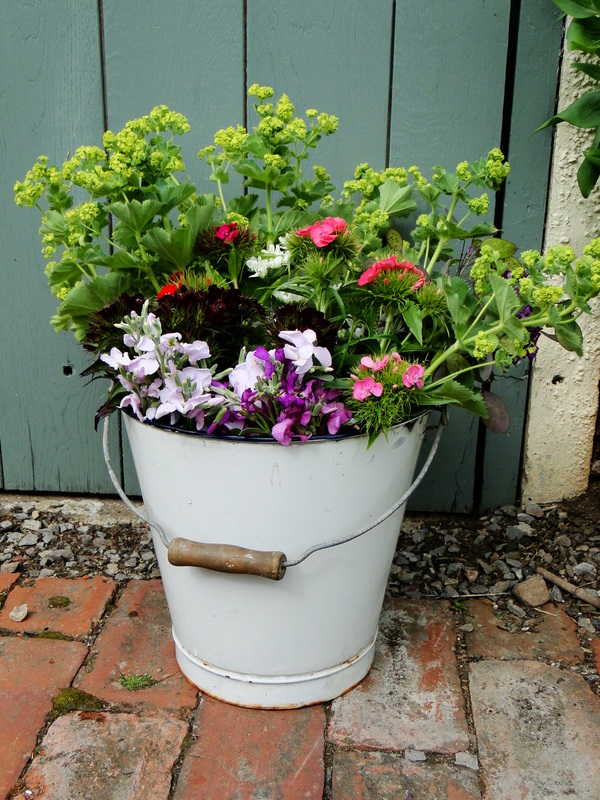 I was inspired to grow my own cut flowers this year by the gardener, florist and TV presenter Sarah Raven. 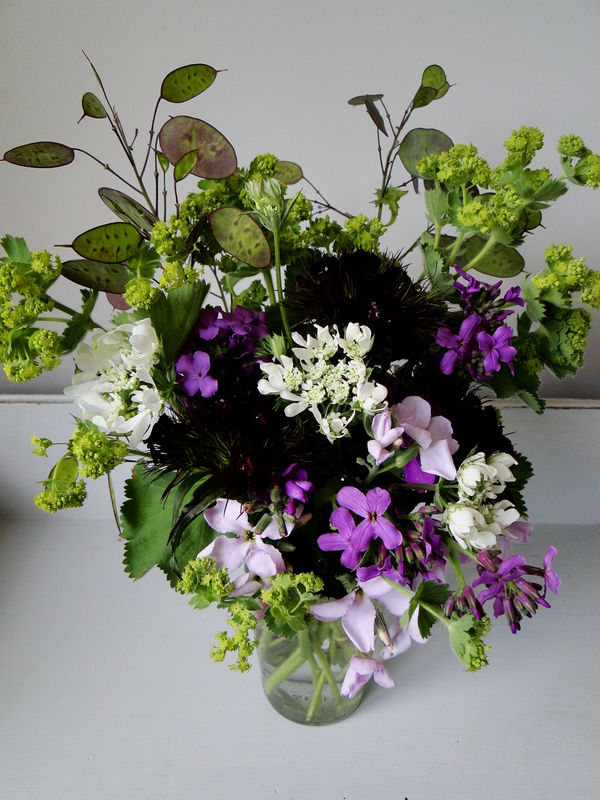 I’ve never really liked a lot of the flowers available from florists and the arrangements feel too stylised, I much prefer a more natural look and flowers that are in season. I know the red rose is the symbol of love but I would much prefer a bunch of Cornish sweetly scented Narcissi for Valentine’s Day. My local supermarket had started to sell more traditional British flowers and I would look at the varieties on offer and think I could grow them. So I did. I’ve had flowers to cut for the house since the end of May and I still have some going strong. 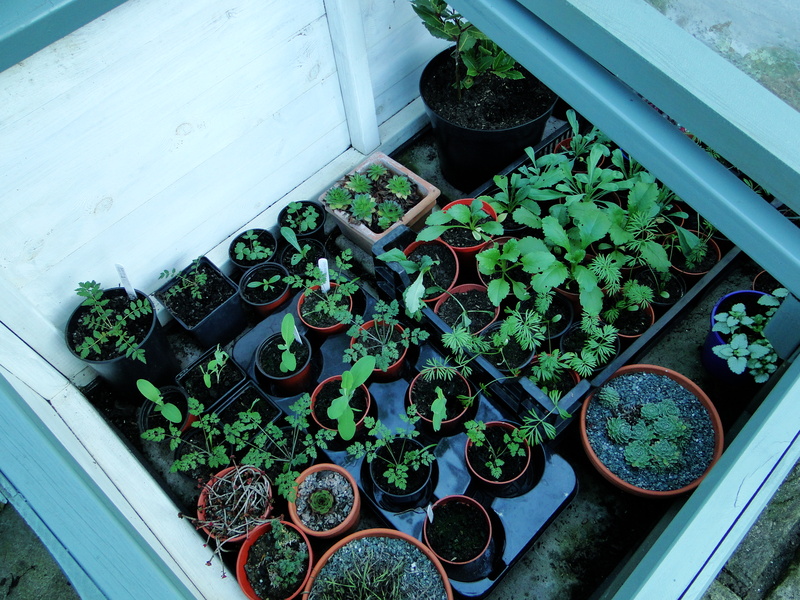 I’ve grown sweetpeas, nigella, cosmos, sunflowers, didiscus, dahlias, cornflowers, calendula and antirrhinums. 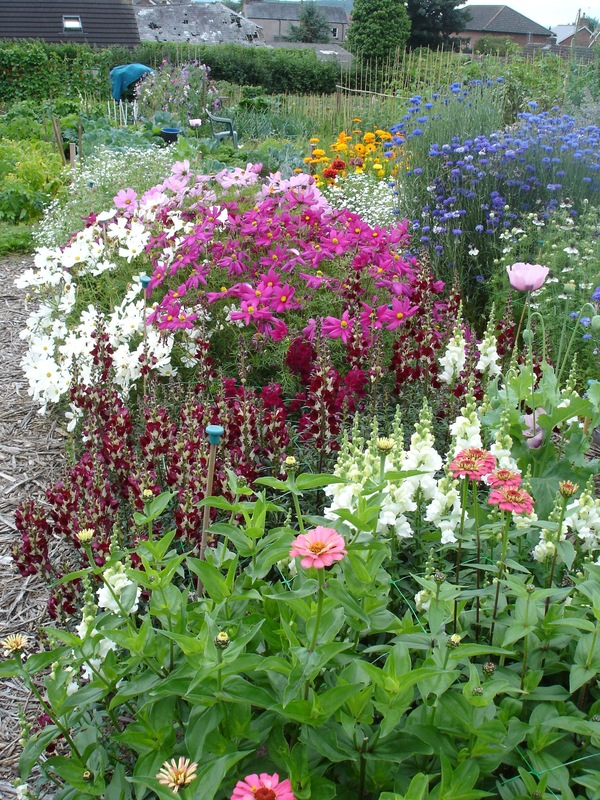 All, apart from the dahlias were raised from seed. 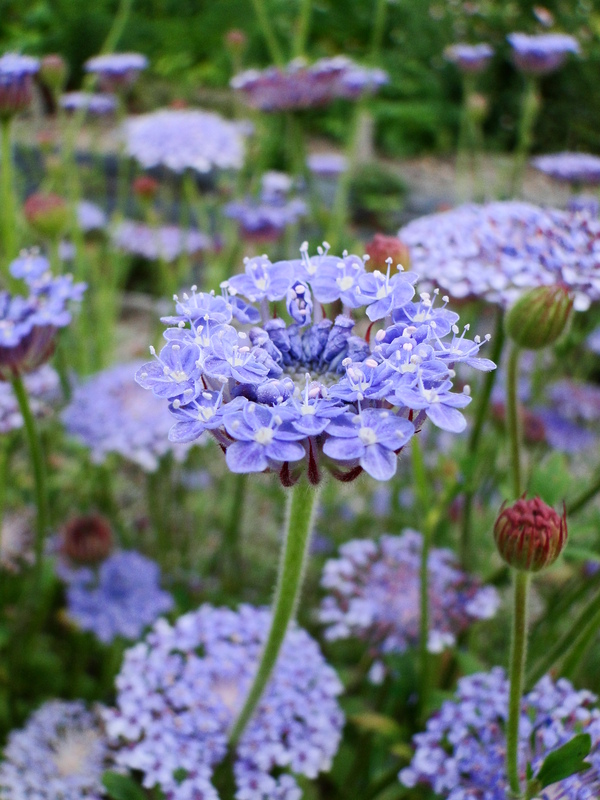 I’ve recently read about the impact cut flower production has in parts of Africa and South America where flowers are grown to supply the European flower industry. 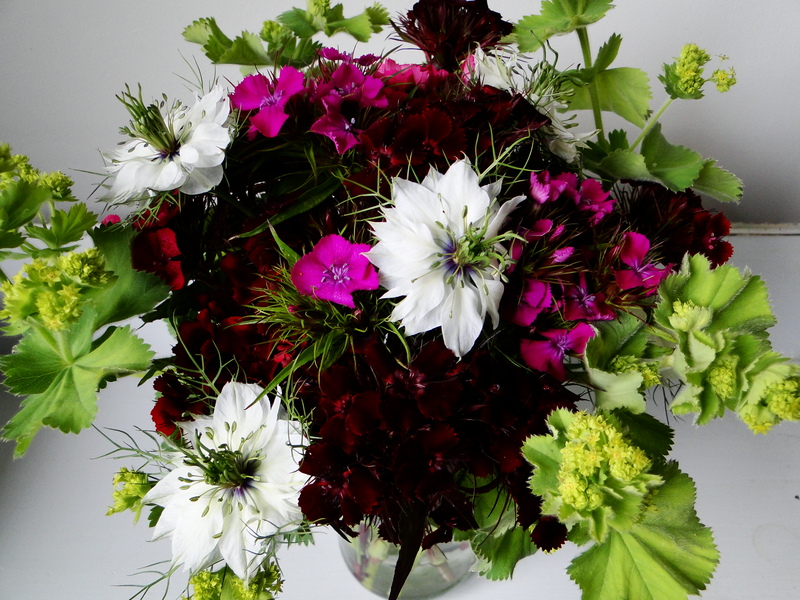 These are often countries where fertile land for food production and water are in short supply, regulations on chemicals usage are not as strict as in the EU and growing large scale monocultures is affecting biodiversity and all of this to produce a luxury purchase – a bunch of flowers. 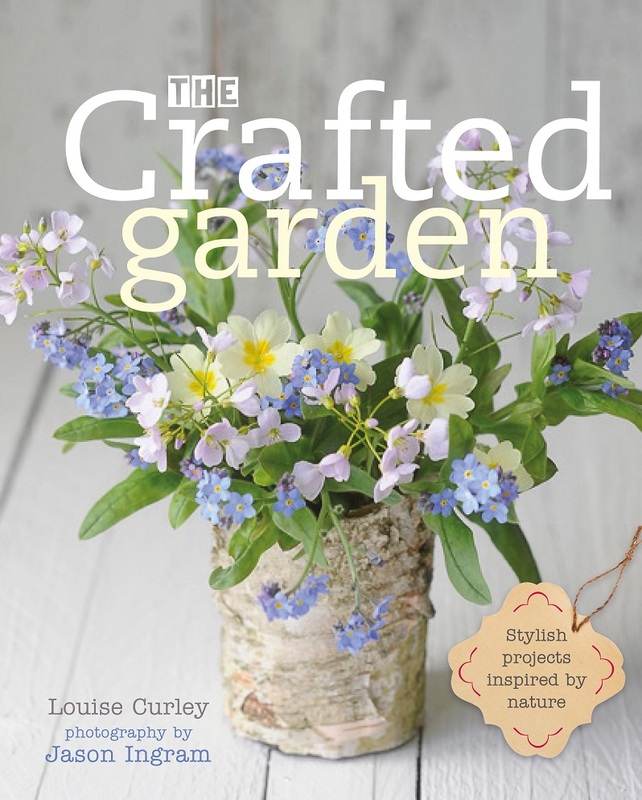 The Ecologist has an interesting article entitled Green Living- Behind the Brand – Cut Flowers if you are interested in reading more. 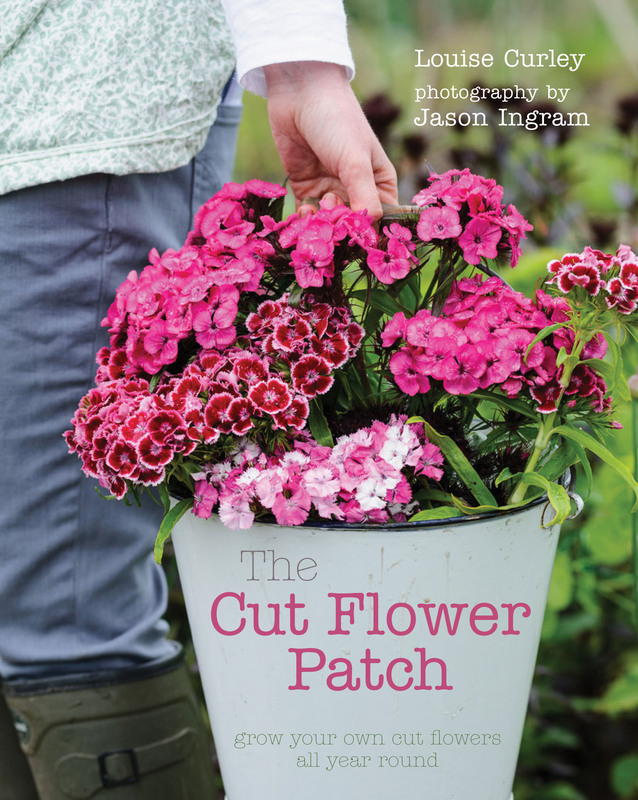 There are an increasing number of British cut flower growers such as Wiggly Wigglers and The Real Cut Flower Company and more supermarkets are stocking British grown cut flowers but if you’ve got a patch of garden or an allotment why not grow some of your own. 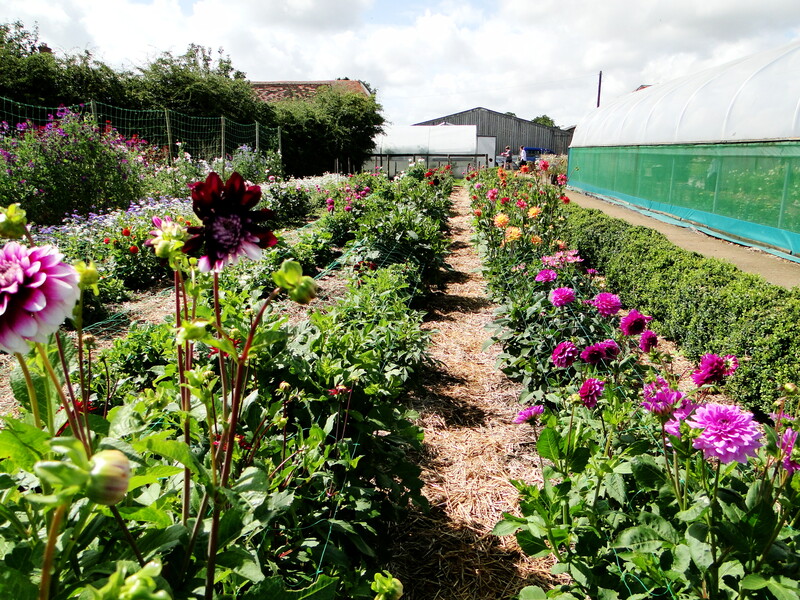 Not only will you have the pleasure of picking your own flowers but there won’t be any airmiles, hopefully no chemicals and insects will love them too. I will post at a later date the tips I’ve learnt this year and varieties I would recommend.